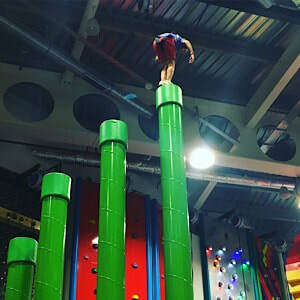 ​Rock up in Hull is an indoor climbing centre based in St Stephen’s shopping centre, which is next to the train station. We have been here a few times and it is really good fun. There are 26 different walls to climb, and they go up to around 25 feet high. The different walls require different skills, agility and courage so there is a lot to go at. There is also a vertical drop slide (where you get winched up) for the more adventurous . The Child likes it as he gets to climb up to serious heights then jump off into the air, supported by a harness and belay device (rope type thing) which means you drop fairly gently to the ground. I like it as there is a maximum number of people allowed to climb which means even at its busiest, it is not heaving. The cafe is right next to the climbing area, so this means you can sit and have a coffee and a natter in fairly relaxed surroundings, whilst watching your cherubs get some good healthy exercise. The Rock up team are present in the climbing area to help clip and unclip the children from the various climbing walls so this is good as you don’t have to jump up every 2 seconds to help them. I believe you can however go into the climbing arena to help your child / children if you want to. So this is all good, the children are exercising, there is a decent cafe, it’s not too busy and you don’t have to expend any energy for a full hour. The only problem I have is that some of the climbs make me feel slightly sick when watching The Child as he clambers up and then leaps into space without a care. The one that makes me feel particularly nauseous is the one with green pillars which you climb up, each one getting taller than the previous one and then you stand on the (really quite narrow) bit at the top and leap off. I am very proud of him though for his courage, determination and perseverance in literally conquering the dizzy heights. But uh oh, there is a new threat to my so far very relaxed enjoyment of Rock Up. Adults are also allowed to climb (she says in a whisper). The Child has not registered this fact yet, as on the occasions we have been it has only been children participating in the climbing. I am dreading the time when he realises and then starts badgering me to join in the fun with him. There’s no real excuse that I can come up with, other than ‘Mummy is too lazy’ and I am slightly concerned about the potential damage that I could do to myself given my current levels of fitness (poor to non-existent). I am indeed particularly concerned about the way my bottom alarmingly jiggles every time I break into even the slightest jog and I suspect that if I attempt this climbing malarkey that I may well be using muscles that have not been used for a very, very long time, therefore rendering me in a whole world of pain the next day. However, given the fact that my bottom is jiggling in this fashion, perhaps it is time to address this and perhaps the rock climbing is a good place to start. It is low impact exercise that offers a full body work out and cardio fitness that will also strengthen your core. And it is inside so no cold or muddiness going on, also I’ve just read that you can apparently burn 500-900 calories an hour rock climbing. Hmmm, interesting. Also, I feel I would require some new gym gear in order to pursue such an activity (purchasing of new things always a winner) so actually I may well consider it, although I don’t think I will be going on the green pillars any time soon! You should ideally book if you want to go as it is not guaranteed that there will be free spaces. You can climb from the age of 4 and there is no upper age limit. There is also a soft play area for under 8s and they offer toddler climbing sessions midweek. The standard climbing sessions are normally one hour and you need to arrive about 30 minutes before to allow time for the introduction, safety briefing and harness fitting. They also offer children's parties and Rock stars which is a climbing club for 4-10 year olds. There are also Rock Ups in Birmingham and Whiteley.